Space. 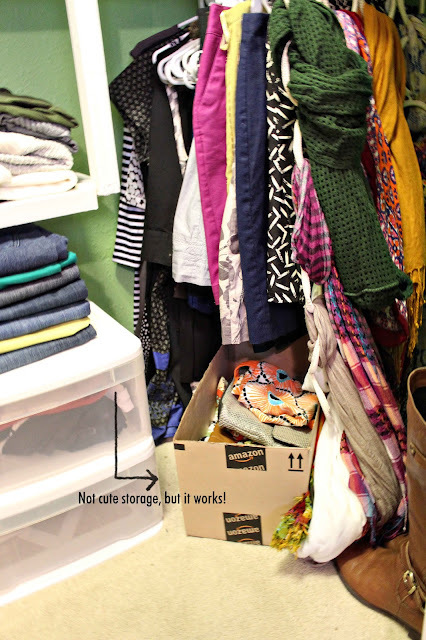 Keeping out-of-season items out of sight frees up space for other, seasonal clothes. Forces you to purge clothes twice a year. Every time I change out seasonal clothes (for us, usually April and October) I go through each item currently hanging in the closet. I pull out the seasonal clothes and sort through them. Each item that hasn't been worn during that season (more details below) gets donated. Essentially, less clothing goes into storage each year (or, more realistically for me, the new items I've bought replace the items I get rid of, so I never have to worry about storing more items). Get rid of anything you haven't worn in a year. There are a couple of ways you can keep track of this - turn your hangers one way and then as you wear items, flip them the other way. Or, place all of your clothing items on one side of your closet and move them to the other as you wear them. Personally, I have so few clothes it's easy to remember whether or not I've worn them. Donate or sell old items. Here is a great article on how to sell, swap or donate clothes. You can also try to sell items with storenvy, poshmark, plato's closet, or other similar stores. 3. 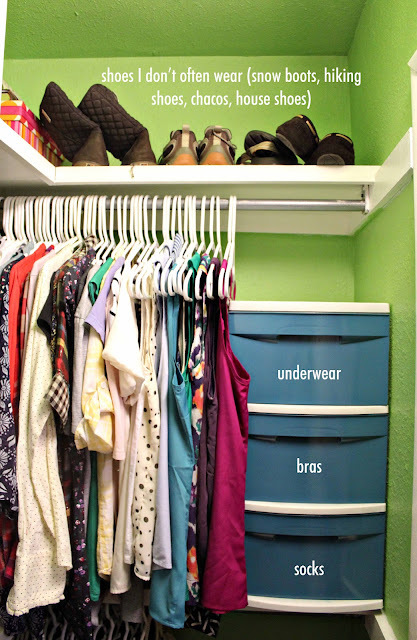 Invest in a good closet organization system. We were lucky enough with our current closet to not to need to purchase an installation system, but most of the time they are worth investing in. If your closet only has one shelf and a bar underneath it, you'll never be able to maximize your space. 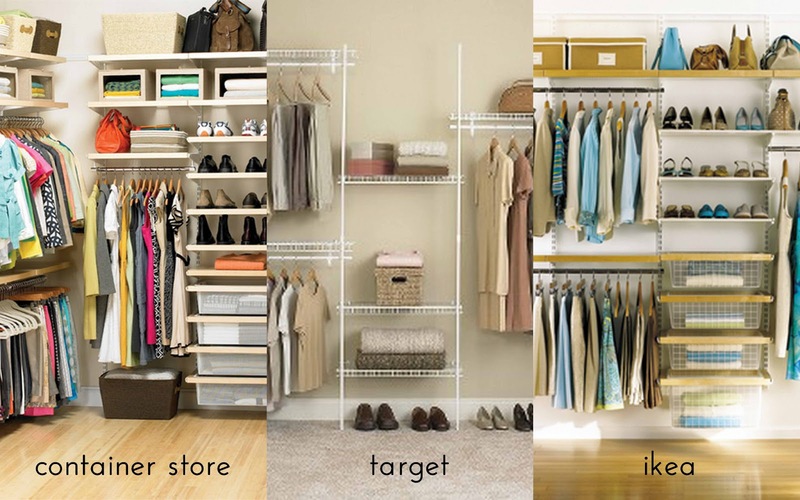 Purchase an easy closet organizer from IKEA, the Container Store or even Wal-Mart. It will probably cost you at least $100, but it is completely worth it! 4. Utilize bins, baskets and drawers. 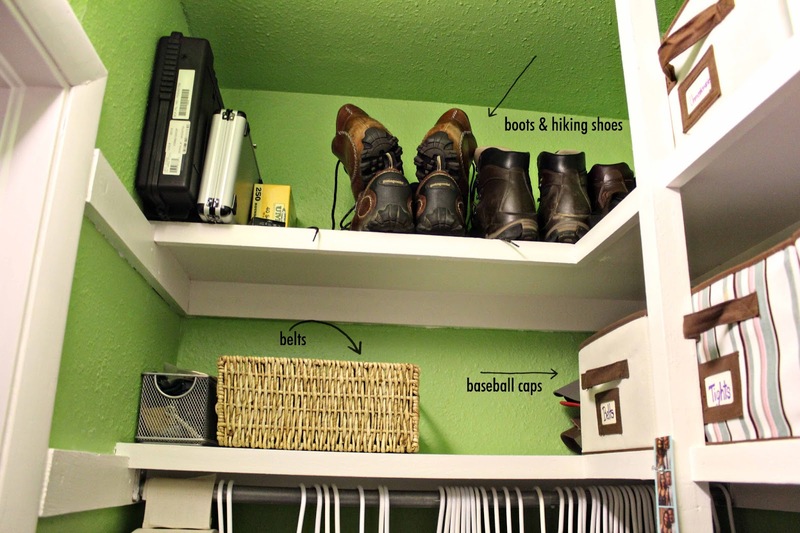 Not only do baskets make your closet look pretty, they will help keep you incredibly organized. 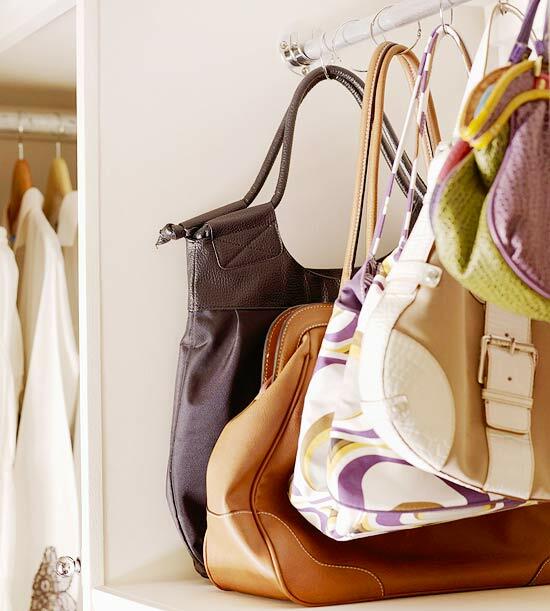 Stacking belts or purses on a shelf will work fine the first time you organize, but eventually it will turn into a jumbled mess. Group like items together (i.e. don't put your belts with your t-shirts) in each bin. Bonus points for labeling. 5. Recognize unused space and maximize it! In closets, the underutilized space is often on the door, under your hanging clothes or in an awkward corner. Figure out a way to use it. For us, it was underneath the bottom shelf. We purchased those plastic drawers from Lowe's and now they hold t-shirts and workout clothes. Other places that may be underutilized: the back of a closet door, space underneath hanging clothes and corners of shelves. I don't have a dresser, so I used some extra space next to my hanging clothes to store undergarments. I used an old plastic drawers (see how I painted them here). 6. Have a space for everything as well as room to grow. Keep in mind that you'll probably be adding to your closet regularly. If all of your drawers are crammed full and there is no more hanging space, you probably need to reevaluate where you keep things and/or get rid of more items. 7. Know what works for you. Organization is different for every person. That's what makes it fun. For example, I love the idea of storing t-shirts vertically so can see them all (<< click for video). 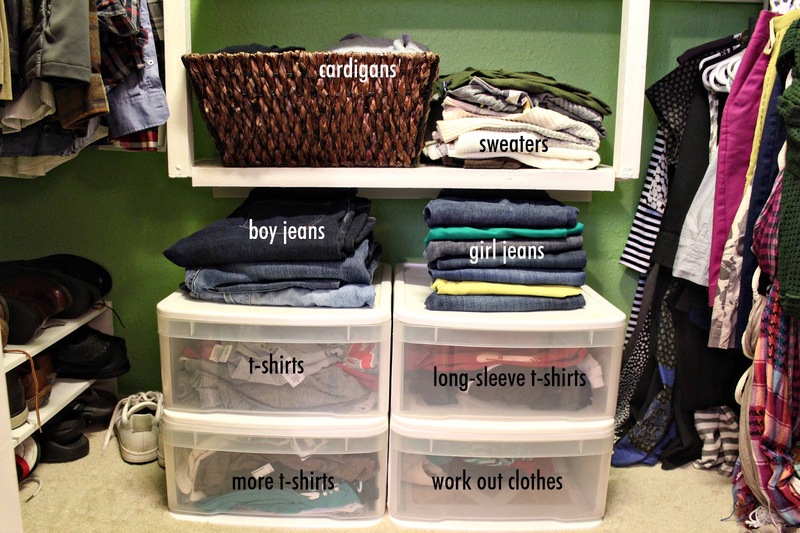 I love the idea, but that won't work for me because I have short, flimsy, plastic drawers for my t-shirts. However, t-shirts aren't a part of my every day wardrobe because I work in an office. So, there really is no reason for me to be able to see them all at the same time. Do what works for you. If you need to incorporate a chair next to your closet because you like to toss your clothes after you wear them, do it. If you wear scarves every day, put them somewhere where you can see them. 8. Make it Pretty. In my personal experience, the more attractive something is, the more likely I am to keep in clean and organized. Closets aren't typically a place we think about decorating, but it's important to incorporate a little "pretty" and a little "you" to make it something your proud of. I painted the inside of all our closest when we moved in a few years ago and it's just so much better than the dingy, off-white before. You don't have to spend a lot of money to make it pretty - paint is cheap. Use what you already have and make it look better. For example - I used to hate all the plastic drawers in my closet, but instead of buying new ones, I painted them. What about you guys? Anyone else have a small closet? Any tips or tricks on keeping things organized? Great post & helpful info. I dont have much clothing & tend to dress in layers, so 1 closet fits everything. I do however have plastic bins with a lid for shoes labelled summer in a box with all the summer stuff, winter box & another box for boots. As for my necklaces - I have them displayed on some colored glass bottles from the thrift store. Easy to see & put back. I can add that I had 1 of those sliding doors on the closet - so took those off as found 2 distressed wooden doors that someone trashed - they even had the hinges, so just screwed into my sheetrock wall !!!. Those make the closet look like some type of armoire now. I'm so glad you liked the post! Oooh, I bet the distressed wooden doors look amazing! Our closet door is a cheap, hollow wood one, so I'm sad because I can't really put screws or anything in it to hold more items. I wish I could! I've seen some great plastic shoe bins - that might be something I should look into! Really great tips. Much better than my strategy...kicking my husband out of my closet to have it all to myself. Haha! When we first moved into our house, my husband used the guest room closet. I begrudgingly decided to share with him, so that is actually wear this post came from! Very pretty closet and great tips for utilizing space. When we built out house, we made our closet extra tall for an extra row and I store off season stuff up there. It makes it so much easier to see what I have. i love this. i, too, have a small closet and am constantly trying to think of more creative ways to store everything. i recently did a tour of my own closets and am glad i stumbled upon yours! thanks for sharing! I'm so glad you liked the post, Heidi! I'll have to check out your tour! Maybe too late for my comment as this post from last week but I also have a small closet. What I did was hang all my clothing color co-ordinated so all the white stuff is together, all reds together. Makes life easier when I have to hang back - for multi colored clothing - whatever is the dominant color also goes into the color category. The minus of this is that all winter & summer stuff hang together but its visually nicer to look at. Thank you so much for your comment! I LOVE the idea of color-coding. I color code - after I sort between tanks, short-sleeve and long-sleeve. I like the way complete color coding looks better, but I find that my tank tops always get lost when I do that! 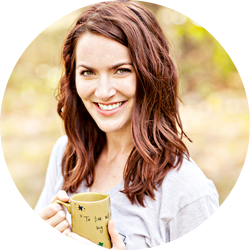 I'm always changing up my organization strategies to be honest - I love getting tips! You seriously just made my day, Rochelle! Thanks so much! Where did you get the white shelves?? They were built into the house when we moved in! I don't fold my t-shirts that way (I only have small plastic drawers and it wouldn't work), but I provide a link in the post to the blog that explains it - I also provided the link below. I think it would work really well in a single drawer unit. I hope that helps! Perfect for getting me motivated to reorganise my closet for Fall and Winter. BTW, even I use those little plastic drawers for hair accessories, earrings and little trinklets. So convenient! I'm curious, Ashley, how deep is your closet? I think it's really smart how the clothes rods are on the end like that. It might be an option for our new house, which has little closets like this. Thanks! I just measured and the closet is just a couple inches over 3ft deep (it's also 6.5 feet wide, in case that is helpful at all). I love the layout - it definitely is a smart use of space! I wish I could claim that as my idea, but it was set up like that when we moved in! i LOVE closet posts. And this one is extra good. 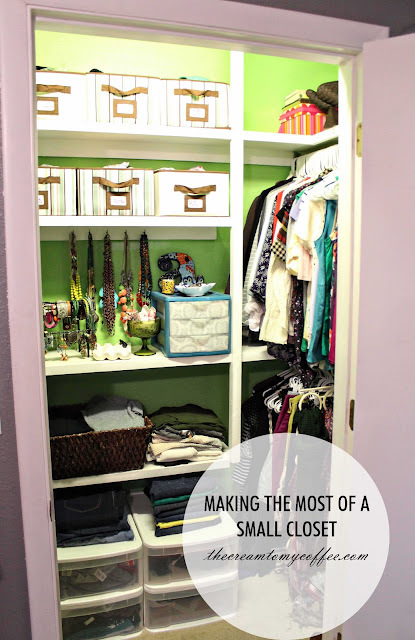 First off, serious applause that you share a closet, only use a closet, and it's one that is this small! I tried the closet only/no drawers option in my last house and ended up with a lot of stacked t-shirts everywhere. It's clear that you have a very objective list of what you keep & wear, that's awesome! I have to say I really love the jewelry section, so adorable but still very organized! 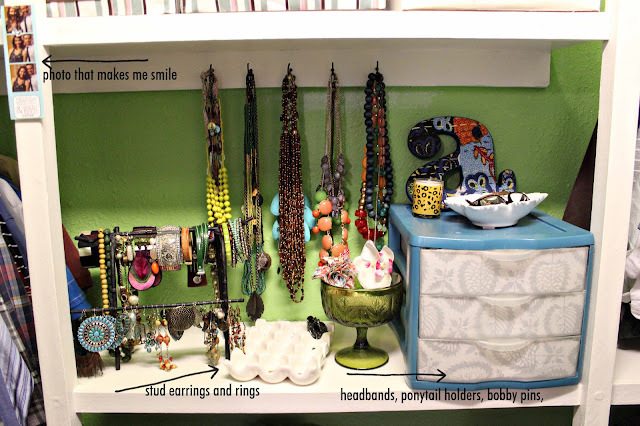 Painted plastic drawers is a great idea too, they can look so cheap and drab otherwise! Thanks for sharing!! Pretty determined to "wear through my closet" by flipping hangers now! Oh last thing- it's great that all your storage boxes look cohesive, really adds something to how cute the closet looks!